The all new Polar M400 is here. If you’re looking for a sporty partner with smarts, sensationally good looks, great sense of direction and loads of other top qualities, we’d like you to meet Polar M400, our newest pride and joy. 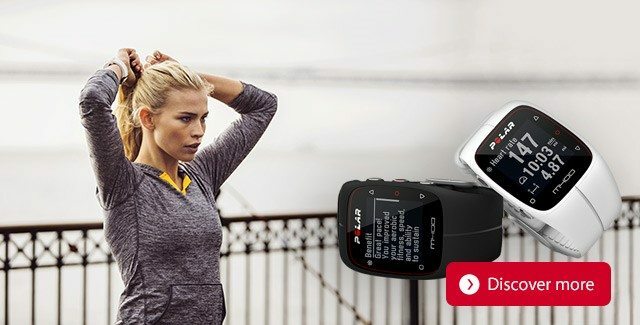 M400 tracks your speed, distance and altitude, so it’s an ideal companion when you head out for a run or a ride. If you hear the call of the more adventurous routes, you can try them safely, as M400 helps you find your way back home. Lightweight and compact, M400 is made to be with you all day long. It captures you activity, gives you guidance how to reach your daily goal and reminds you when it’s time to get up and move. If you’re all set on getting in top trim and ready to beat yourself to the punch, M400 keeps the score of your personal bests and lets you know when you’ve made a new record. It also comes with loads of other advanced training features that really help you step up your game.